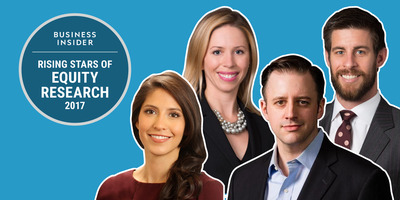 Business Insider today published its list of the rising stars of equity research. We spoke to dozens of nominated analysts. These are their views on markets’ hottest sectors. In conversations with dozens of finalists for the Rising Stars of Equity Research, Business Insider got an inside look at how some of Wall Street’s top young stock analysts view the market today. These young analysts spoke optimistically about the current bull market, now in its 10th year of record gains. They’re not worried about a correction or downturn anytime soon, despite what some of their older peers are predicting. You can see the full list of finalists here. Goods will always be bought and sold, regardless of medium, says Simeon Siegel of Nomura-Instinet. It’s just a matter of convincing a consumer to spend at one particular store and not a competitor. “If you think about what was the job of a retailer, it has always been two-fold: getting you into their store, and then getting you to open your wallet. Those are two very different jobs,” he said in an interview. Siegel says brands like Tiffany, which recently opened a highly exclusive “blue box cafe” in its Fifth Avenue store, and Amazon, the clear dominator of e-commerce, are best poised to whether this shift in the retail industry. Cybersecurity is an ever-increasing threat, and company’s are taking notice. Firms dedicated to cybersecurity are poised to gain from this trend, our finalists said. Data service providers are also seeing increased business as more companies move their operations to the cloud. For security-sensitive information, specialised data center providers like Equinex and Switch are well-positioned to outperform next year, an analyst said, as businesses realise not all clouds are created equal. Other top technology picks from the rising stars of equity research include network security provider Forescout,Microsoft and Amazon, this time a pick for its web services unit. A significant portion of the rising stars list consisted of biotechnology, biopharma and other science-related fields as banks and investors pay closer attention to the sector. Two areas of studies mentioned by multiple rising stars are gene therapy and RNA therapeutics. CRISPR, short for “clustered regularly interspaced short palindromic repeats,” is a revolutionary tool that allows researchers to go into a cell’s DNA and modify a mutated part of the gene, a process known as gene editing. The technology is on track to be a $US10 billion market by 2025, analysts say. Top stock picks in this space are Quorum Health, Blueprint Medicines, Alnylam Pharmaceuticals and Alexion Pharmaceuticals, our finalists say. You can view the full list of Wall Street’s Rising Stars of Equity Research on Business Insider Prime here.